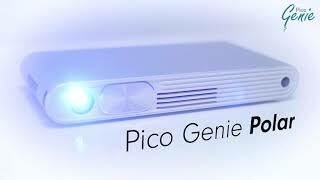 The Pico Genie Polar Smart Projector offers great design and fantastic bright image quality with a solid quality build. Offering extensive wirelessly connectivity to almost any device and a simple user interface. With its Android interface it allows stand alone usage of the projector without the need to connect to any other device or you can wirelessly mirror your screen from your iPhone, iPad or Android phone/tablet. This model has one of the highest specs at 500 ansi lumens at a breakthrough price point representing great value for money. Use the Android interface to download apps and watch TV, Netflix, Youtube etc or use for business or learning via apps such as Microsoft Office or download games. Alternatively wirelessly mirror your iPad or iPhone or Android tablet/phone on the big screen via airplay / screen mirroring / smart view. Overall, the Pico Genie Polar is one of the best value projectors with its quad-core processor, 8G memory, intelligent Android 4.4 OS, Wifi wireless Internet access, a full-function remote control and wireless mirroring to Apple, Android and Windows devices.